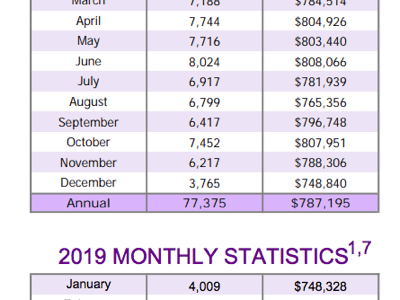 Total sales - meaning all home types across all of TREB‘s entire market area - were 5,025 on the month, a little below “flat as” at -2.4% [5,148 last February]. The overall average price in February was 780,397, up a thin 1.6% [767,801 12 months earlier]. The time it took to sell a home in February? Uhhh...more crepe than pancake, actually: 0.0% change at 25 Days on Market, on average. Inventory? Total Active Listings in February were changed less than a percent compared to the year earlier figure at 13,284 homes on the market [13,362 last March]. See? Pancakes. All figures herein are year-over-year comparisons unless otherwise noted. Enough of that. How About waffles? The “New Listings“ Numbers were down 6.2% compared to last February at 9,828 [10,473]. But we’ve said it before and I’ll say it again because it’s something we’ll never waffle on: Given the practice of terminating and re-writing listings - generally done when a home’s been on the market “too long”, and often coincident with a price “adjustment” - the new listings figure gets distorted. So, what’s all that mean? Well, the Forward Inventory numbers look pretty normal based on the sampling. Obviously the Spring of 2017 was unsustainable as we noted at the time. We also noted in February, 2014 that the FI figure of 2.45 months was “relatively tight” by historical standards. So do we have a “new normal”? Are we beginning a bounce-back from the post-peak correction? Are we just passing through “relatively normal” on the way to “hell in a handbag”? Who knows? But talking to one mortgage person today, the “take” from that perspective is that we have a degree of “gridlock”: People want to buy up; people want to downsize...what’s missing is the first-time buyer. They can’t qualify for the first-time house because a] prices are still very elevated, and b] the interest rate they have to qualify at is 2% higher than they’re actually qualified for because those are the terms of the OFSI [Office of the Superintendent of Financial Institutions] “stress test". So, do the math. On top of that, I had a call from a US-based investor looking to buy into the Toronto area real estate market via single family homes - specifically a Bungalow on a decent lot that he could renovate and then rent out. He has $150,000 in cash as a down payment. Bottom line? Between the price levels, the Land Transfer Taxes, and the 15% foreign buyer tax, forget it. No deal. It should also be noted that the "stress test" is "federal"; the foreign buyer tax is "provincial" - formally referred to as the "Non-Resident Speculation Tax", it was instituted as part of the Wynne government's Fair Housing Plan in the Spring of 2017 and applies to any transfer to a "foreigner" [as defined] of residential property in the Greater Golden Horseshoe. There are some limited provisions for exemptions and/or rebates. I’m not saying there should be no stress test. I think it’s actually a good thing. Remember “The Big Short”? And I’m not saying the answer is to find “foreign buyers” who can afford to buy where “locals” cannot, just to break up the gridlock. What I’m saying is that, no matter how you cut it, either prices need to fall further, or huge “grants” need to be handed out to first-timers, or interest rates need to fall further. The second or third options aren’t going to happen. At least, not to any significant extent. The only other scenario to bring prices into line in the bigger - e.g. “international” - picture would be a big drop in the Canadian dollar. Maybe the stress test came too late. There's an old saying in the real estate business: When the average buyer can't afford the average house, the party's over. The Detached group saw a 9.6% drop in the number of sales in Metro Toronto to 470 units at an average selling price of $1,294,936, up .8%. In “The 905“ area - the balance of the GTA - 1,701 Detached homes changed hands, +4.2%, at an average sale price of $894,147, down 1.9%. Sales of Condo Apartment units dropped 6.7% in Metro Toronto to 1,064 units at an average selling price of $612,488, +7.4%. In the balance of the GTA, 472 sold, off 3.5%, averaging $448,711, up 3.1%. “The OSFI mandated mortgage stress test has left some buyers on the sidelines who have struggled to qualify for the type of home they want to buy. The stress test should be reviewed and consideration should be given to bringing back 30 year amortizations for federally insured mortgages. There is a federal budget and election on the horizon. It will be interesting to see what policy measures are announced to help with home ownership affordability,” said Toronto Real Estate Board President, Garry Bhaura in the report. Thanks for stopping by... Until next time - Andrew. Questions? Comments? ...We'd to hear from you!